Aurora is a Symbol Mattress model carried by some rental stores, for example Rent-2-Own and Rent One. The two firms' descriptions differ in the number of coils. However, they agree on the rest, including the ingredients and the models being pillowtop mattresses. 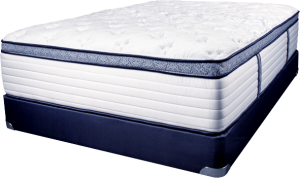 The Rent-2-Own description of the Aurora makes it a close equivalent of the Signature, the second highest model in Symbol's Premium Series of innerspring mattresses. They have coil-on-coil construction with two coils units of pocket coils stacked one on the other for a count of over 2,000 coils. Pocket coils are used for their conformity and quick reponse to a sleeper's change of position. This quick response allows the mattress to adjust to the sleeper immediately while the memory foam takes its time. The "806" coil count cited by Rent One (RO) may be a copywriter's error. Or it could mean one unit of higher coils. Shorter coils (4" to 6") are usually used for coil-on-coil construction with a much higher coil count. So the RO coils may be twice the height and wider for stability by special order. The pillow top on the Aurora has a quilted top panel, high-loft fiber fire barrier, and gel-infused memory foam. The breathable high loft fiber and the gel work with the foam's open-cell structure for cooling. Memory foam conforms to body contours and evenly distributes suport to relieve pressure and support the lower spine. The cover fabric is not identified. The most likely fabrics are polyester or cotton, perhaps a blend. Since it is not named, it does not appear to be a special performance fabric. The borders are quilt-stitched in a diamond pattern. The Aurora, as are all Symbol mattresses, is compatible with adjustable beds. Symbol Mattress also provides an uphostered, wood-framed, solid top foundation. The warranty period for the Aurora is not stated, Look at the tag; the "N" number indicates the length of the non-prorated warranty.